Mr Bru Cru: LA Stars. Al though the Lakers' season hasn't been going as we'll as we thought it would they are slowly making strides and seem to look better and better each game. They lack consistency but hopefully after the All Star Break they can mend that wound and do better. Between the dark cloud that hovers over the Lakers' organization, you see some signs of sunshine. Some light. Dwight Howard is getting Healthier and so is Steve Nash. Pau Gasol has been plagued with injuries this season but he's resting and trying to come back and make a difference for the team. Then you have Kobe. The Black Mamba is having one of his best statistical season in his 17 year career. Read that again. Yeah, kind of blows your mind. He's leading the league in scoring at 29.7 PPG and I have a feeling that he'll continue to try and lead his team into the playoffs. Time can only tell. Aside from that. 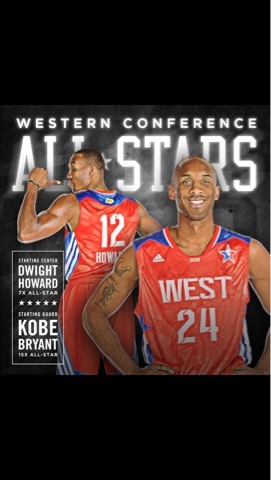 The point I was trying to get at was that the All Star starters have been named and Kobe has been named a starter for the 15th straight time. FIFTEEN. Not to mention he led the league in Votes. I'm pretty sure he could care less about those stats but those are the things us fans love to see. #LakeShow.